Ever thought about taking your campervan on a skiing adventure? Parking up at a mountainside motorhome point with a snowboard, salapettes and a lift pass? 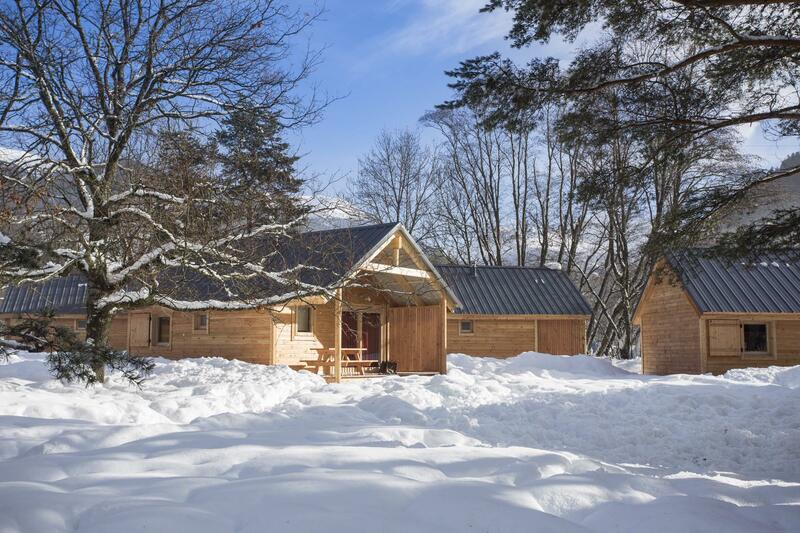 Or perhaps you’re decidedly more of a winter chalet person, looking for a timber lodge with open fires and room to dry off? However you choose to holiday, there’s a whole community of happy campers out there who head to the mountains every winter, searching for popular camping spots that have turned up the heating and opened their gates for the busy winter ski-season. It takes less than 10 minutes to drive to the slopes from Huttopia Bourg-St-Maurice, with both a nursery slope, two red runs and a blue run weaving their way into Les Granges (1,250m). You’re better off using the ski bus or funicular railway, though, which continues through the village and straight on up into the heart of Les Arcs, ending at the 2,000m station. The campsite, set in the bottom of the valley, keeps its chalets open during the winter season – featuring wood-burners, central heating and room for up to 6 people in each – as well as the cosy, central, reception lodge where there’s free Wi-Fi, a log fire and a library corner. Campervans and motorhomes are welcome too – the washrooms are fully heated and there’s a ski room for drying off all your gear – while a discount is available on lift passes bought through the campsite. This hamlet of 20 chalets, open through winter, capitalises on a location next to one of France’s smaller and lesser-known resorts: Puy-Saint-Vincent. The result is less après ski and a more family-friendly feel, with young children, early teens and beginners particularly in their element on the slopes. It’s a 10-minute drive from the campsite to the ski area (a regular bus also runs) or you can cross-country ski straight from your chalet, with a pleasant cross-country route following the course of the River Gyr. At less than €200 for a week-long ski pass, it’s a great value offering even if the size of the resort is less suited to the most advanced skiers. 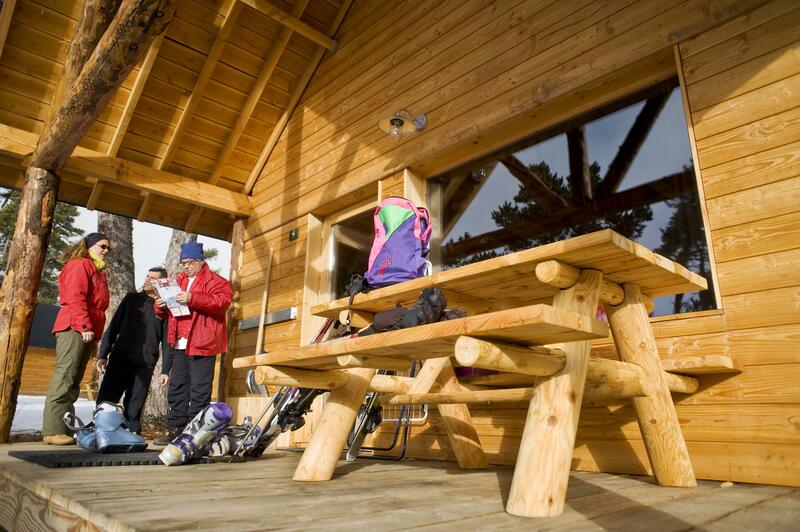 At 1,800m, the chalets at Huttopia Font-Romeu are as close as you’ll get to a ski-in-ski-out campsite experience. Aside from taking your skis off to cross the well-ploughed road that passes the campsite, you can ski to the entrance throughout most of the season and the main lifts are only two minutes up the road. The altitude makes the resort a safe bet for late season snow too (there’s still some 500 snow cannons just to make sure), while extensive trails make it particularly popular with cross-country skiers. 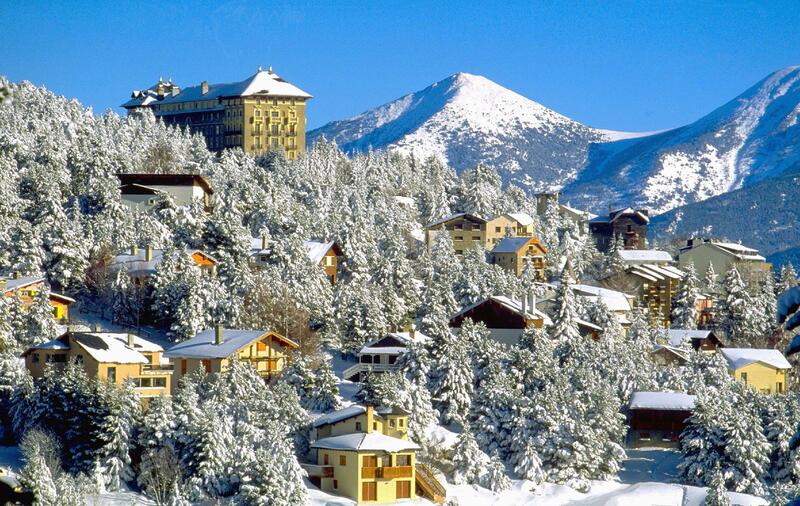 Like Puy-Saint-Vincent (see above), Font-Romeu is a family resort, with a good choice of runs, from black to baby slopes, as well as a day-care ski school for toddlers, Le Club Piou Piou. 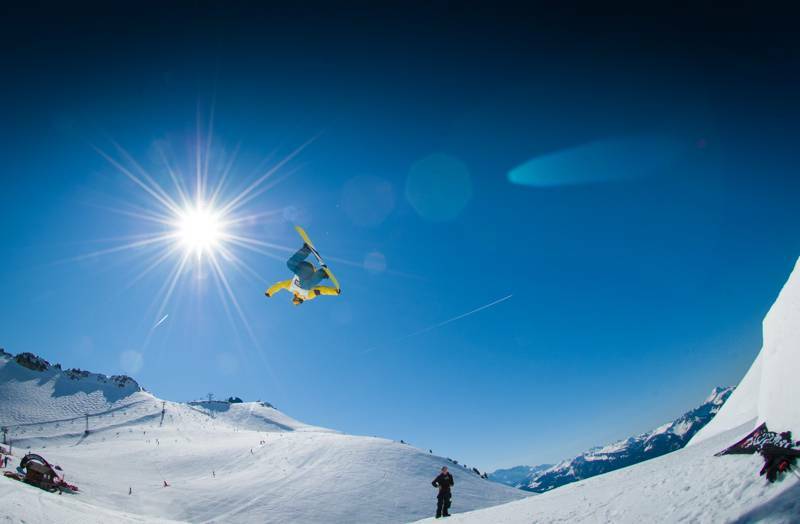 More advanced skiers can pay for a Les Neiges Catalanes ski pass, which provides access to five neighbouring resorts too, while the nonplussed can simply kick back and enjoy the sun instead – with 3,000 annual sunshine hours, Font-Romeu is officially France’s sunniest ski resort. The village of Bozel has just one ski lift and a green run. Not much to speak of it seems. Yet, located in the heart of the Tarentaise Valley, this super-central hub is within easy reach of heaps of Europe’s most prestigious major resorts. Méribel, Courchevel, Les Menures, La Plagne, Tignes, Val-d’Isère and Val Thorens are all eminently skiable from here, with a lift up to the main La Plagne slopes from Champagny-en-Vanoise a 10-minute drive down the valley, while lifts into Courchevel are found a 10-minute drive in the opposite direction. 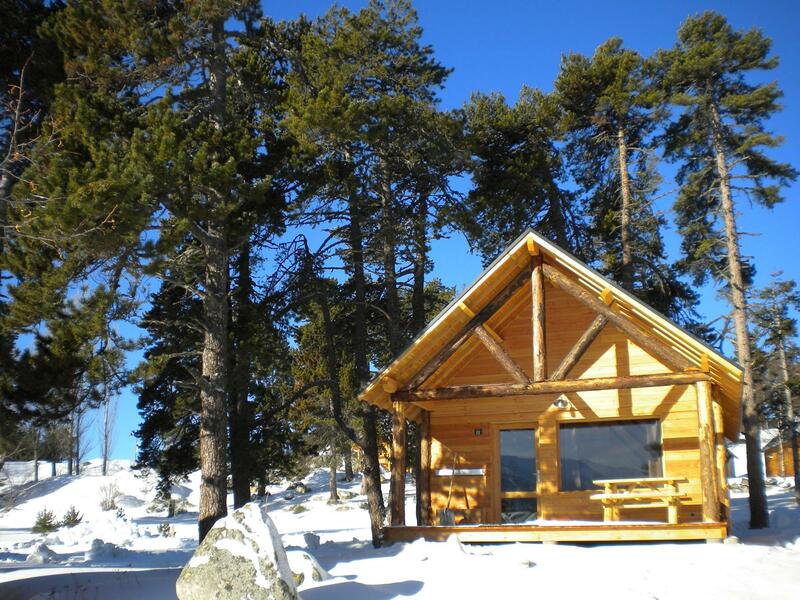 The result is a campsite that can’t offer ski-in-ski-out or instant access to any particular resort but instead provides easy access to a whole smorgasboard of different places. For advanced skiers, the result is endless miles of pistes, with a convenient base back at the bottom of the valley. Located just over 20 minutes from Geneva airport and with week-long ski passes costing less than €170 each, Divonne Les Bains, near the lift stations of Mijoux (part of the Monts Jura ski area) is a great option for budget holidays. 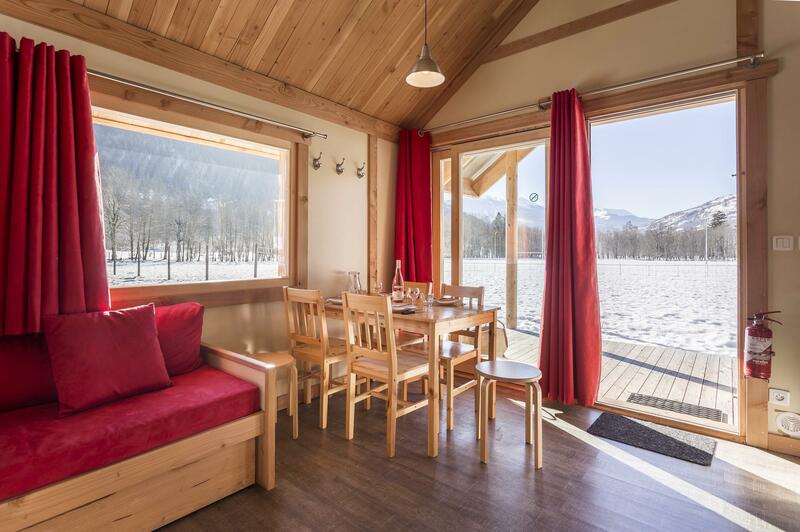 The campsite itself opens up chalets throughout winter, each sleeping six, with wood-burners, central heating and en-suite facilities, while a ski bus ferries you to and from the lifts, 20 minutes away. There are drawbacks: the ski area is one of the lower altitude picks, making the season shorter and slushier than most, and many of the lifts are the drag type, which can be tiring on the legs. For short breaks, however, there’s plenty of piste to cover and great facilities for families. A top pick for those on a shoestring.